News just in from Bob Denison at Denison Yacht Sales that Joe Laundrie has signed the 26.52m motor yacht Bella Donna II for sale. Built by Johnson Yachts in 2008 to a design by Bill Dixon, Bella Donna II comes fully loaded with every upgrade and option. Accommodation is for eight guests in a master suite, VIP stateroom and two twin cabins while twin 1625hp Caterpillar engines deliver a cruising speed of 18 knots. 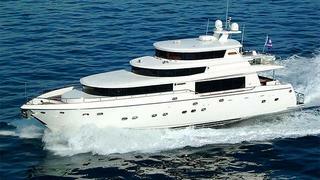 Located in the centre of Fort Lauderdale for easy viewing, Bella Donna II is asking $4,495,000.